This case study demonstrates the simplicity of using the Autodesk Within Medical software to transform an existing acetabular cup design to one with superior qualities that may aid osseointegration while maximizing on the inherent benefits of Additive Layer Manufacturing. An acetabular cup is the part of a hip implant that is adhered to the pelvis, providing a solid fixation for the ball of the joint replacement to sit in. For implant stability traditional implant designs used cement and multiple screw fixations, however superior mechanical strength can be achieved by inducing osseointegration – the ingrowth of bone into an implant. 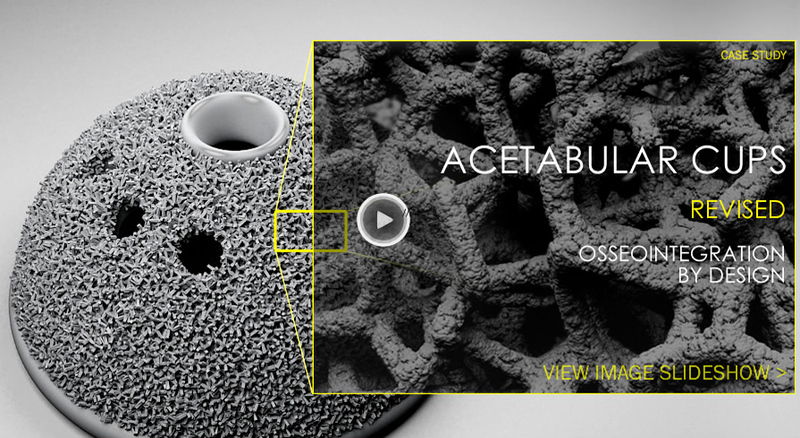 The trabecular lattice featured in the Autodesk Within Medical is designed to encourage this. A wide distribution of pore sizes is thought to encourage a more secure fit, with larger pores favourable for stress transfer and smaller pores beneficial for initial fixation. Within Medical gives designers the power to choose the pore size of the trabecular lattice and even vary the porosity throughout the implant. A stable initial fixation of an implant secures the implant and allows for bony ingrowth. This is aided by a good “scratch fit” – a rough surface increases the cortical bone contact with the implant, scraping the host bone surface and filling the lattice pores with bone material. Autodesk Within Medical gives designers the power to choose from different levels of surface roughness. As the implant was manufactured in a single phase using Direct Metal Laser Sintering (DMLS) there is structural continuity between solid and porous sections. The acetabular cup implant was built in a biocompatible titanium alloy with the entire contact surface formed from trabecular lattice. Once removed from the build plate and cleaned, the implant can be coated with a hydroxylapatite bioabsorbable filler to further stimulate bony ingrowth.